Whatever Estate You are In – Let An Experienced Attorney Plan For You | Horton Law Group, P.A. Do any of these 10 scenarios apply to you? If yes, You should consider consulting with an experienced estate planning attorney to make sure your family is properly provided for, to make sure your assets are protected and will be distributed as you wish and to make sure your estate can avoid the time, expense and headaches of Probate Court. You support a Family Member or Friend who depends on you financially or who has Special Needs. You tried to “Do-It-Yourself” and created your own estate plans. 9 out of 10 “Do-It-Yourself” plans are NOT executed in compliance with Florida law, are invalid, outdated or Not properly funded. You own a Business or hold Interest in a Business. You are Divorced, yet still have in place your estate plans that were drafted when you were married. You and your Spouse have Children from a Previous Relationship. You have a Pre-Marital Agreement or Post-Marital Agreement. You do not have a Designated Health Care Surrogate to make medical decisions for you in the event you cannot. You do not have an Agent designated in a Financial Power of Attorney to make financial decisions for you in the event that you cannot. If you have questions about the content of this blog or if you would like additional information, please feel free to contact Sommer C. Horton, Esq. of the Horton Law Group. You can reach Ms. Horton at 561-299-0018 or email her at shorton@horton-law-group.com. PreviousIf You Buy A “Lemon”, You Are Not Stuck With Making Lemonade – You Have Rights Under Florida Lemon Laws. NextFirst, comes the engagement “ring”, second, comes the wedding “ring” and third, comes the “suffer-ring.”…Should I Protect My Assets? Is it Too Late? BAD DOG! Dealing With A Dangerous Dog! 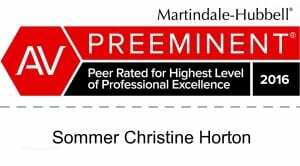 Sommer C. Horton, Esq., Honored for Excellence in Law Ms. Horton is the founder and owner of Horton Law Group, P.A.